While concerns about a potential eruption of the supervolcano beneath this iconic park may garner the most alarming headlines, a more likely hazard in the coming decades is a large earthquake. “The biggest concern we have for Yellowstone is not with the volcano, it’s with earthquakes,” said Michael Poland, scientist-in-charge at the Yellowstone Volcano Observatory, a consortium of eight organizations led by the U.S. Geological Survey. On average, Yellowstone experiences 1,500 to 2,500 earthquakes a year, most of them so small they can’t be felt. But large quakes can – and have – occurred in the not-too-distant past. 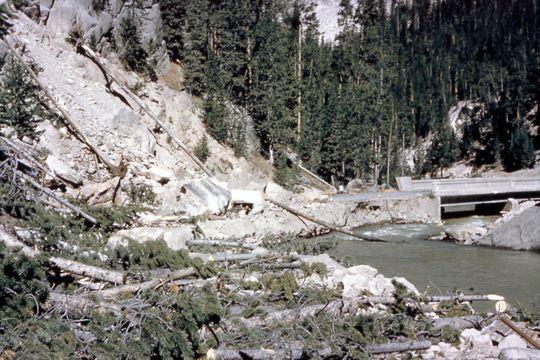 On Aug. 17, 1959, a magnitude-7.3 earthquake rocked the park, killing 28 people when a landslide roared through a campground. 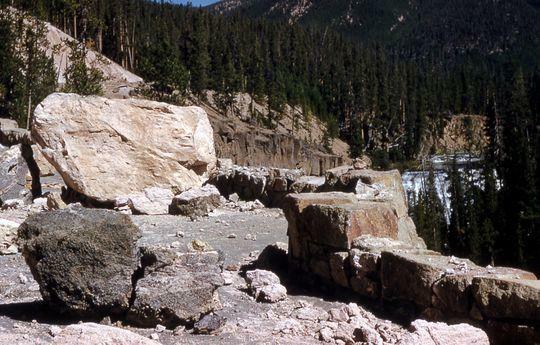 More than 80 million tons of rock fell, blocking a river and forming a lake, aptly named Earthquake Lake, that remains today. At the time, the quake was the second-largest in the lower 48 states in that century. It remains the largest historical earthquake in the Intermountain West, a region between the Rocky Mountains to the east and the Cascade Range and Sierra Nevada to the west. Compared with even a minor eruption of Yellowstone’s super-volcano, the threat of an earthquake on a similar scale happening again is more likely. “That’s something that happens on a human life scale,” Poland said. But unlike a volcano, large earthquakes don’t show warning signs. 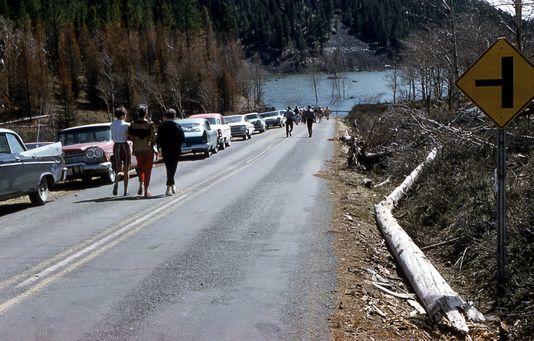 The hazards posed by a large quake today would be greater than what happened nearly 60 years ago due to a higher influx of visitors, especially in the summer. More than 4 million people visit Yellowstone every year, with peak visitation in July and August. “It would be a lot worse today with more people in the area,” said Jamie Farrell, a geology professor at the University of Utah. Yellowstone sits in a rural area with few roads. If one road goes out, it creates a huge detour, Farrell points out. If two roads become impassable, sometimes you can’t even get there by car. “The good thing is that Yellowstone is one of the best seismically monitored regions in the world,” he said. More than 40 seismic stations with the University of Utah continuously record the Earth’s movements in and around the Yellowstone region and report back to the National Park Service. “We can’t predict them, but by looking at past data, these earthquakes tend to cluster in areas,” Farrell said. Minor earthquakes rattle the park pretty much every day. But visitors wouldn't know it: The quakes are so small, they're picked up only on seismographs. Scientists watch those quake swarms diligently, keeping a close eye on the timing, location and depth. "We're well aware there is a potential, because it's a dynamic system, that we might want to actually move people away from an area or close an area," said Jeff Hungerford, the park's geologist. The Yellowstone system has two main contributors to its earthquakes: the volcanic system, which puts stress on the crust, and the tectonic system, which is represented here by an area of active stretching of the crust from east to west. The earthquakes also play an important role in helping keepgeysers like Old Faithful rumbling. "We need this seismicity to keep these beautiful features alive because they clean the throat of many of our geysers and pools," Hungerford said. In addition to a major quake causing landslides and damaging or collapsing buildings and bridges, there's another hazard: It could trigger a hydrothermal explosion, a mixture of hot water, mud and rocks that could injure people if they happened to be nearby. As for a large earthquake triggering a volcanic eruption: While that is possible, a lot of things would need to be in play. The 1959 quake, for example, didn’t trigger a volcanic eruption. “In order for a large earthquake to trigger a volcanic eruption, you probably already need to have an eruption almost ready to happen,” Farrell said. Regardless, Farrell said visitors shouldn’t be on high alert for a geological event of any sort. “We like to talk about these big, grandiose things happening like big earthquakes or large volcanic eruptions, but those are highly unlikely events,” he said.